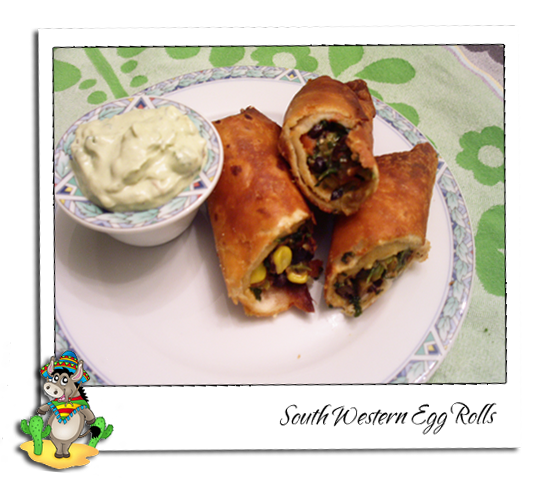 This is a great copycat recipe of Chili’s South Western Egg Rolls and can be used as an appetizers, or dinner since it got everything already in one small package. 🙂 It’s best to make these a day ahead before consumption. The 4 hours 20 minute prep time includes freezing this appetizer. 1. Boil the chicken till done and dice up. Heat 1 tbsp olive oil in a pan over medium heat. 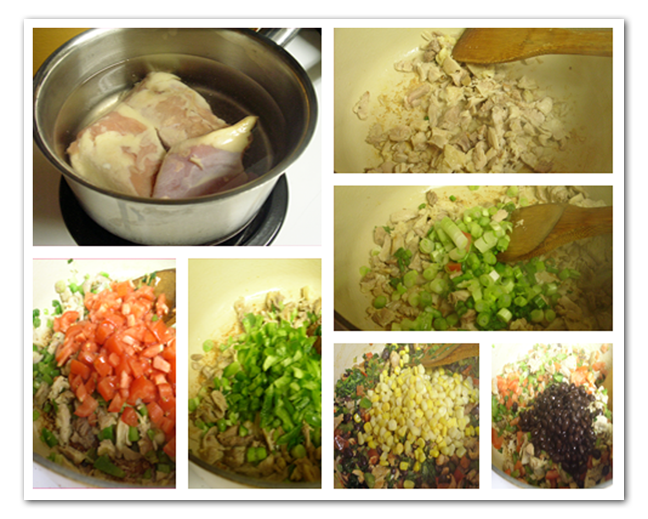 Stir in the cut up chicken then add the green onions and red or green pepper. Cook and stir 3 minutes, until tender. 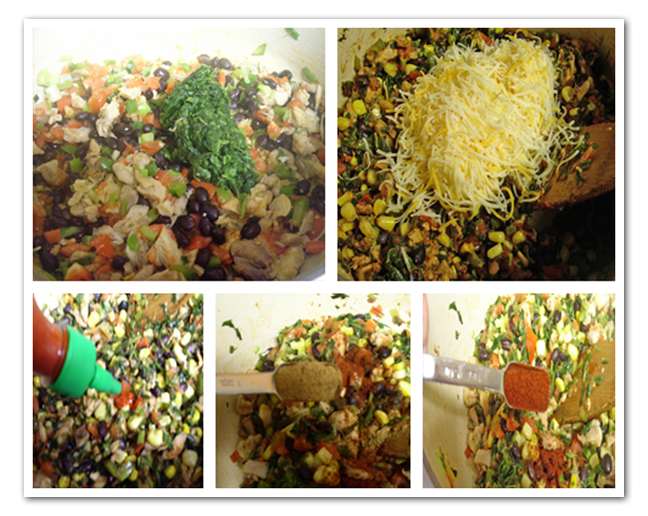 Mix in corn, black bean. 2. Add the spinach, parsley, cumin, chili powder, salt pepper and hot sauce. Cook and stir 3 minutes, until well blended and tender. Remove from heat and stir in the Mexican Cheese so that it melts. 3. Spoon even amounts of the mixture into each tortilla. Fold ends of tortillas, then roll tightly around mixture. Secure with toothpicks. Arrange in a medium dish, cover with plastic, and place in the freezer. Freeze at least 4 hours. 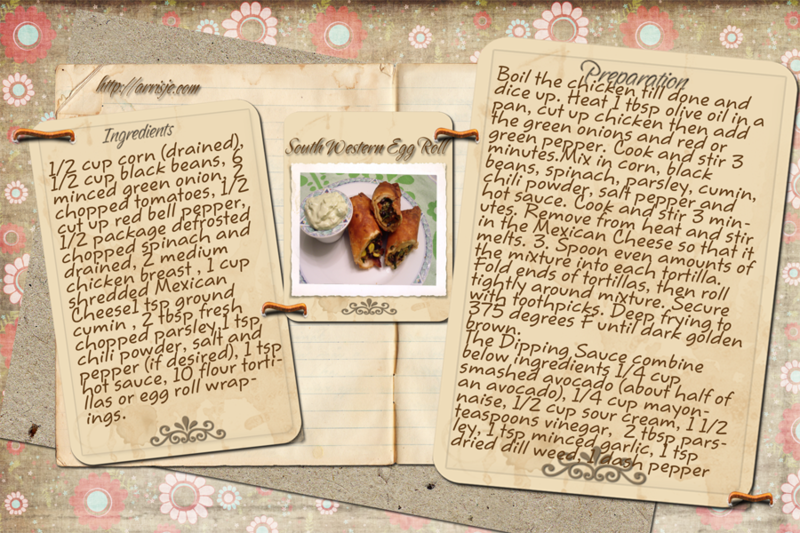 In a large, deep skillet, heat oil for deep frying to 375 degrees F (190 degrees C). 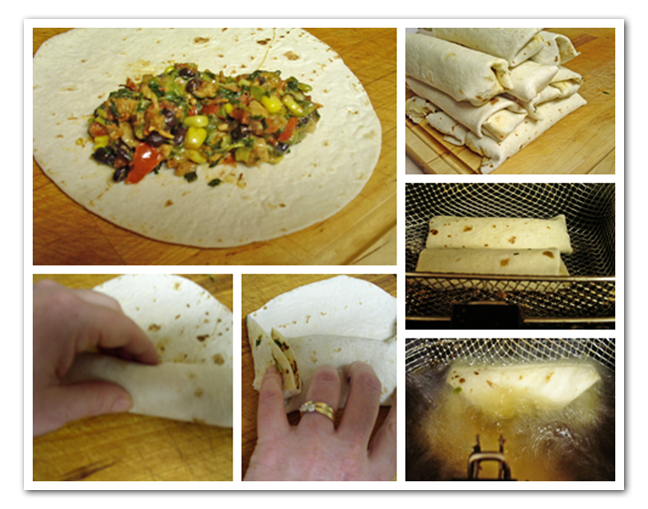 Deep fry frozen, stuffed tortillas 10 minutes each, or until dark golden brown. Drain on paper towels before serving. 4. The Dipping Sauce combine below ingredients, put in fridge till ready to eat. 1/4 cup smashed fresh avocado (about half of an avocado), 1/4 cup mayonnaise, 1/2 cup sour cream, 1 1/2 teaspoons vinegar, 2 tbsp parsley, 1 tsp minced garlic, 1 tsp dried dill weed, 1 dash pepper. This is a good copy cat recipe of Chili's and can be used as an appetizers, or dinner since it got everything already in one small package. 🙂 It's best to make these a day ahead before consumption. .The 4 hours 20 minute prep time includes freezing this appetizer. Add the spinach, parsley, cumin, chili powder, salt pepper and hot sauce. Cook and stir 3 minutes, until well blended and tender. Remove from heat and stir in the Mexican Cheese so that it melts. Spoon even amounts of the mixture into each tortilla. Fold ends of tortillas, then roll tightly around mixture. Secure with toothpicks. Arrange in a medium dish, cover with plastic, and place in the freezer. Freeze at least 4 hours. In a large, deep skillet, heat oil for deep frying to 375 degrees F (190 degrees C). 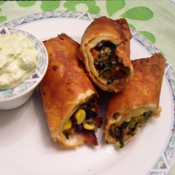 Deep fry frozen, stuffed tortillas 10 minutes each, or until dark golden brown. Drain on paper towels before serving. The Dipping Sauce combine below ingredients put in fridge till ready to eat. ¼ cup smashed fresh avocado (about half of an avocado), ¼ cup mayonnaise, ½ cup sour cream, 1½ teaspoons vinegar, 2 tbsp parsley, 1 tsp minced garlic, 1 tsp dried dill weed, 1 dash pepper.